If you have any other information regarding these print outs feel free to post in the comments, this was all the information I could get out of them for the time being. This is a basic timeline of events to catch up .. 3 dots are some kind of code found on varied game items and movie props.. we dotn knw where it will lead yet. http://www.jivid.com/?p=6288 Not complete but a bit of background for the game. 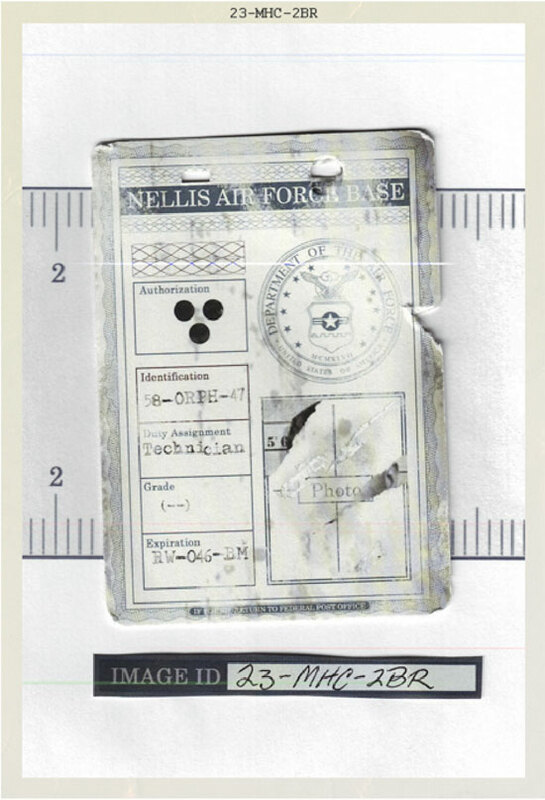 Don’t know if I read it wrong but isnt Area 51 apart of Nellis AFB? Also looks like the first guy is caucasian might be a tan/bad lighting for his picture. Could they be trying to reverse engineer something? I think so. Also theres a word underneath the Eagle, I can’t make out what it says but I see “New Mexico”. We can certainly say that the “3Dot” company has a high reach in government, most likely, private clearance only. I believe the text under the eagle says “MCMXLVII” which would be 1947 in roman numerals which is the year the Air Force was founded. 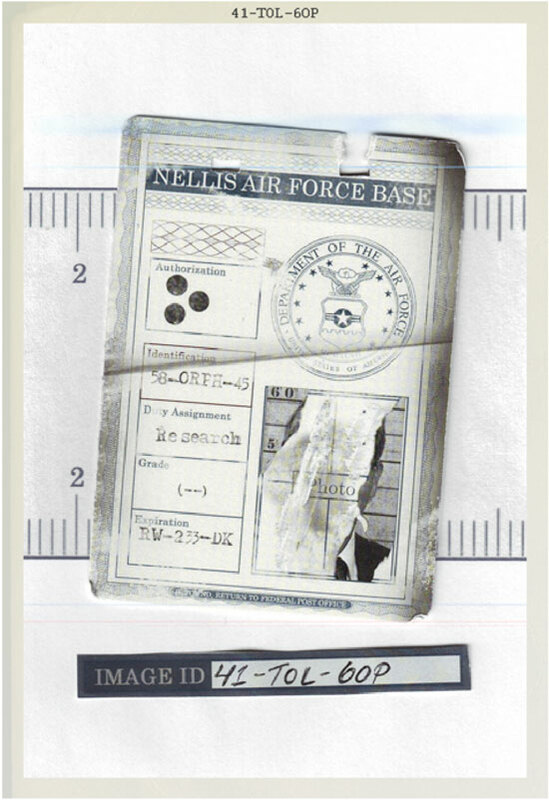 i asked the airforce ROTC teacher Major Takahara at my highschool he said that the printouts look like line badges basically they give someone access to classified areas and that where the 3 dots are there should be logs and the technician is a flight technician who would with the badge fly classified planes in this case super 8 the plane would be a UFO and the area from my guess would be area 51 and the researcher would from my guess research the UFO thats all the information that i have for right know. Great info! Try to get more info please! So Rich…any information we are missing now? nobody knows the meaning of the letters and the numbers on the expiration ???? 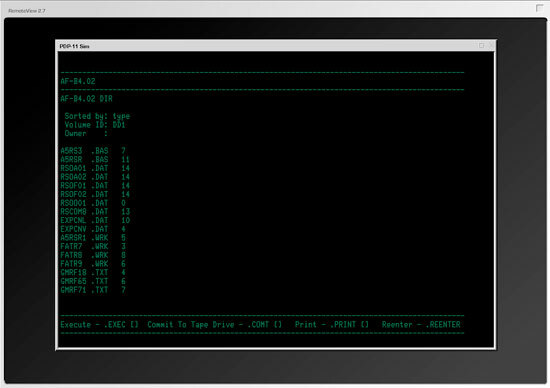 just wondering but has anyone figures out the .REENTER command yet? Or the rocket poppeteers site? or better yet wat the heck is up with RSOO01.DAT. u can print it out but its blank wtf. I’m gonna go out on a limb here and say that the “3 dots” is a secret symbol representing Area 51. It’s also under Authorization, so it might be a way these people are allowed into Top Secret stuff. Is it just me or are the dots in different positions a sideways triangle for some and a point down triangle for another. I wonder if this could mean anything as well. The tech ones point down the researches are slanted. Fallout: New Vegas was created based on real places… since it takes place in Las Vegas and the surrounding areas it would make sense that Nellis would be included in the game since it’s a real place…. just wanted to help you out since I see you are still trying to figure out what he was referring to.. It looks like the Researchers are not in uniform (dark tie light shirt). Is this important? For scientists/researchers, often times ties, shirts, vests, and sports coats were their uniforms. The supposed UFO crash in Roswell, NM happened in 1947, and Philip Corso wrote a yarn (published as non-fiction) about allegedly reverse-engineering technology from the crashed saucer. OMG i know this is random, but i think i found something…. Y ep Big Mike is right here especially when the context speaks about a shipment. I think that if we can find out the shape of the dots in Josh canister we can match it with one of the i.d cards, and possible find out which one belonged to his dad . I think the last id is his dad’s. One with tie. This makes me think of one of the history channel shows that was on a couple of weeks ago aboot this guy that signed away his rights and things to do research on a ufo and maybe reverse engineer it. He talked aboot a base that was well concealed with some kind of ground camo.could be something thou , he had a kind of card like these guys. J.J. Abrams is trying to make you buy more food? I’ve been told that Walter from Fringe also like Slushos. I think its time to “ASK” is there is a discernable pattern to the release of clues to the GAME. If there is, I’m sure the anticipation of a known upcoming event would be better to facilitate discussion on our end. I dont think people will “just go check sties” to find clues, and things may get lost. You’re assuming that the handwritten “TROGL” is a name–it could be anything from what happened to the individual at the time, or his present assumed status = he’s gone underground? 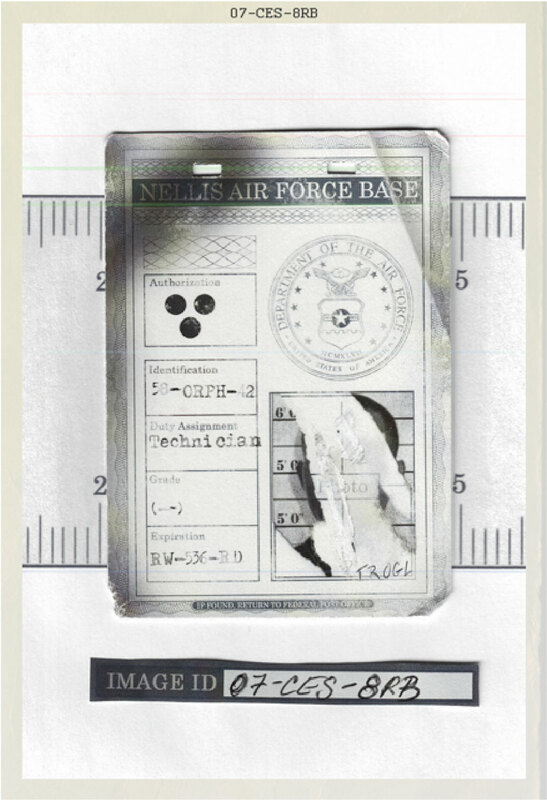 Maybe we should be focusing on that one, the next clue could be with this id tag?? The trailer looks pretty cool actually, but it has nothing to do with Super 8. It’s produced by Spielberg but directed by Jon Favreau so no connection to JJ Abrams who is really the key player in all this viral stuff. 3.James Cameron has worked with J.J. on some of his projects, James Cameron also helped develop the idea of the Predator’s mouth! I.E. 3-dots may be a reference to James Cameron and his ide! 4.J.J. abrams has 2 J’s is one of them James? bc My name is james so itd be funny like, James Cameron, James J. abram, and then me James Vanwhy! that would be sweeeet! Haven’t you heard that the number 4 is the answer to all numbers? Take any number; for example 95. Spell out 95: ninety-five. Count the letters in ninety-five; 10. Spell out 10: ten. Count the letters in ten; 3. Spell out 3: three. Count the letters in three; 5. Spell out 5: five. The answer is 4. You’ll find that in english, I believe spanish, and in german, this works with any number. you won’t find it in russian, but 44 is great miracle, not answer, but question (for me). Mark Twain knew smth, so one of his book is called №44 or Mysterious Stranger. hi Josh! i was reading your posts about the new super 8 clue…wanted to tell you they did a super secret scene at the state park by the lake. and i believe that even tho its ohio in the movie minkers has to do with wv. wv n oh border eachother. i can see oh from my window. and a fog horn is used to guide someone thru the fog or other weather conditions with no visability. wether it be a boat or person. please keep me updated on the viral…im having trouble keeping up on my mobile. “Bring the foghorn and the unexpected title” ring a bell? Sometimes the JACK is out of the box. …and the burger out o the ham! A quick question , has anything been posted in the chat window yet ? Since I think mr mesterio will explain the ids in the chat window. idk but if you go to http://www.super8-movie.com/ and close the movie so it doesnt play so your looking at the camera… it looks like it says something other than “the scariest thing i ever saw” idk I could be wrong, it could just say that, but it looked different to me. We’ve been over this. I forget what it was, but I remember it was something like; Processed By Kodak. Yeah, this is getting really boring. What is this, 3 comments in 3 days? Is everything already off loaded from sties . If “Rick” really was Rick, then we should have our new clue either on thanksgiving or whenever the new trailer is released. The trailer may be released before “Faster”, but that would be unfortunate. Who even wants to watch that movie? We already solved that dilemna. THis was the password to the chat. Bring the foghorn- Toadfish makes foghorn noise. Unexpected frm his 112 post, starting in the first sentence with “Well, that wa unexpected.” Toadfish112.. We need not worry about Bring the Foghorn and the unexpected title anymore. If you google TROGL, on the search it brings up http://www.Trogl.com. All it says is “it works”. Could this be something? Oh, and new hlm post. Dont think it’s anything. Says it was registered December 09. Most likely a guy who typed in some random letters to make a website, wanted to see if he could publsih that website, and when it turned out he could, he types: It Works! My best guess. Aergo, not ig. There is much controversy surrounding groom lake. That was the plan. Divert the publics attention. Same with the base in Ohio. But if people were to know the things I know, it would all fall apart. Luckily for the project, they will never know. The people believe in authority, they’ve grown tired of waiting for miracle or mystery. Science is their religion, no greater explanation exists for them. They must never believe any differently if the project is to go forward. So……what do you know about the project? I think that the ruler in the background might be a clue to a code or something. Notice how on the first pic it shows the numbers 2 and 5 and on the second it shows just 2 the third shows 2 and 6 and on the last its 2 again. Maybe there is a code of 2-5-2-2-6-2 that is supposed to be entered somewhere on the scariestthingsieversaw site. I dunno could be nothing but it seems odd they would go threw the trouble of changing the background for nothing. Someone said something about a status that read “gone underground”? Isn’t that part of the very first viral stuff from the Rocketeers? The ad you end up lining up. Doesn’t one part read, we have gone underground? Did anyone else notice the shift in the dots from the Technician to Research badges? They aren’t lined up the same. Could be insignificant but I thought it looked funny. Big time notice – looks like the 2 techs have the same type of stamp. The researchers on the other hand have the same offset or different angled stamp. 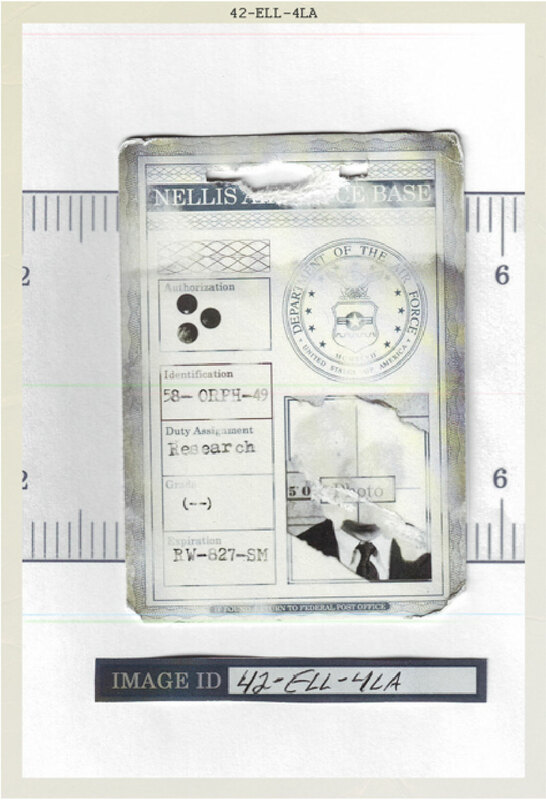 Has anyone looked into the image ID numbers as a possible cipher or a hex string code tumbler? I know AJ loves this kind of stuff and its pretty much right there for everyone to see – possible new code for entry? i did some research on the name “Trogl”, and i found out that its a latin phrase for a cave dweller. So… Trogl lives in a cave? no clue.